Have you ever had pasta with Bolognese sauce? I mean a real, honest-to-goodness Bolognese? 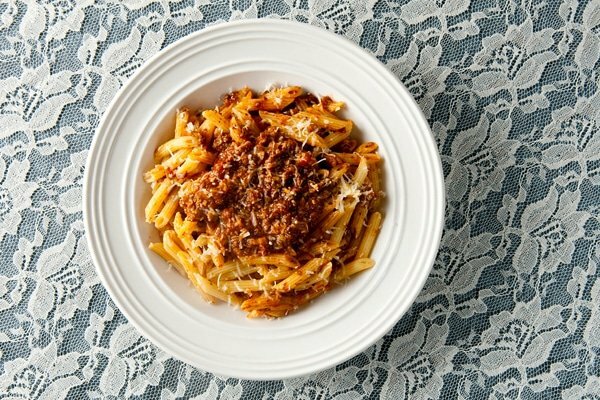 It’s just different from a typical meat sauce for pasta: smoother, meatier, mellower and a lot richer than a typical ragu or sugo. A little goes a long way. There is a reason that the guardians of this sauce are so strict about what is and is not an authentic Bolognese. Much of what makes Italian cuisine so special is its skill with poverty foods. Puglians or Sardinians or the people of the Italian Alps must deal with a limited set of ingredients, and they do so with uncanny ability. But there is no need for this in Emilia-Romagna, where Bologna lies. This region has everything. And it flaunts it. 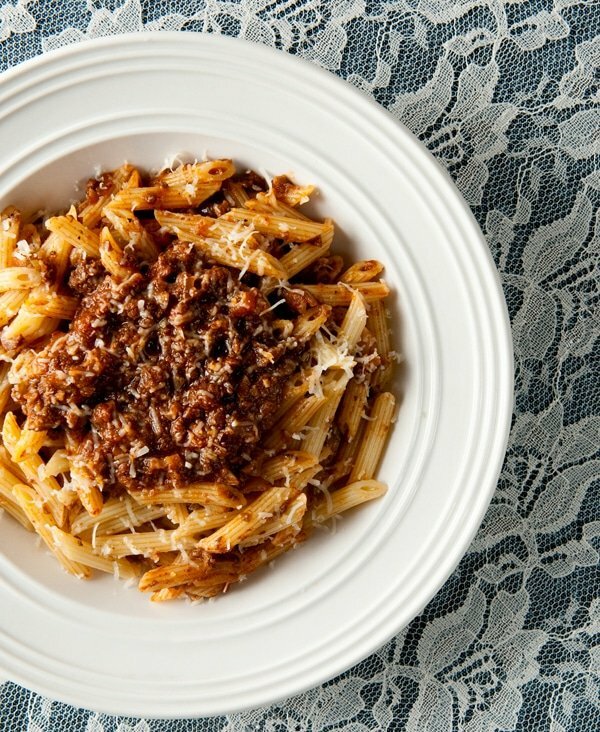 A Bolognese sauce is a crowning expression of the wealth of Italy’s breadbasket. This is a sauce with rules. It is built on a base of onion, carrot and celery. No garlic. Nor does it have lots of herbs in it. I love lots of herbs in a meat sauce, but that’s not a Bolognese. The sauce contains dairy products. Tomato, while present, is not the star of the sauce. Meat is. And to make a real Bolognese, it must cook a long, long time. Bolognese is all about the meat. Emilia-Romagna is a rich region, and this is a rich sauce. Beef is king here, and the sauce is usually a celebration of the cow: beef, veal, milk and butter. But pork is often used, too. And that’s where we start getting into the endless Bolognese Debate — what is, and is not, a “true” Bolognese sauce? Every cook has a personal version. The few constants I’ve just mentioned above. Some have only beef. Some a mix of meats. Some pork. A few, like this one, wild boar. Some authentic recipes use a little pancetta, prosciutto or chicken liver, too. One point of contention is tomato. I use just a little, but most American versions make this a tomato sauce with meat. That may taste nice, but it’s not a Bolognese. I suspect Americans do this because we were first exposed to a sauce sorta-kinda like this by Italians from Southern Italy, where tomato-heavy meat sauces are more common. Mushrooms, specifically porcini, do have a place in an authentic Bolognese sauce. I use dried ones here. Broth is yet another debating point. Many recipes use beef broth, some use water. I used wild boar broth to go with the meat. Wine? Yes, or no. Your choice. White or red both work. What pasta you serve it on is also hotly debated. By far the most common is homemade tagliatelle, which is a little like linguine. But other pasta shapes are seen, too. Curiously, spaghetti — the most common pasta used with Bolognese in America — is almost never used with this sauce in Italy. Again, I think using spaghetti is an influence from Italian-Americans from the south, where dried pasta is more commonly used. Do you need to follow all these rules when you make your own Bolognese? I hope you do, because the result is unlike anything else you’ve ever tasted. Even if you use other meats, such as venison or hare or duck, following these guidelines will make an unforgettable pasta sauce. But the Italian Food Police will not come breaking down your door if you add a little of this or a little of that to your liking. Improvisation is, after all, very Italian. Don't try to make this sauce on a weeknight. It takes a long time to come together, and the time spent slowly simmering really makes this sauce special. But fear not, it keeps in the fridge for up to 10 days, and freezes well. It is a perfect sauce to make on a weekend and eat after work all week. I used wild boar here, but any meat will work. Beef, veal and pork are all traditional, but game meats like venison, bear, ground duck or even rabbit or hare would be good. Heat the butter over medium-high heat in a large, heavy pot like a Dutch oven. Add the onion, celery and carrots and cook gently for 5 to 8 minutes, stirring often. Do not brown them. Sprinkle a little salt over the veggies as they cook. When the vegetables are soft, stir in the chopped porcini and tomato paste and allow everything to cook for 3 or 4 minutes, again, stirring often. When the tomato paste begins to turn the color of brick, add the ground meat, the porcini soaking water and the broth. Bring to a simmer. Allow this to cook down over medium-low heat. Take your time here and resist the urge to do this over higher heat. Stir from time to time. When the liquid has mostly evaporated, add the wine and repeat the process. When that has mostly evaporated, add the milk, nutmeg and black pepper and stir well. Bring back to a simmer and add salt to taste. Let this cook until it is the consistency you want. When you add the milk to the sauce, bring a large pot of water to a boil. Add enough salt to make it taste like the sea. Once the Bolognese sauce has thickened, add the pasta and cook until its al dente. To serve, put the pasta in a large bowl and add a healthy ladle of sauce. Toss to combine. Give everyone their portion, then top with a small ladle's worth of sauce. Grate the cheese over the top and serve. Excellent! Have made this twice. The second time I added 1.5 ounces of pancetta to the initial sauté, which added some violas to the string section. Polenta is another good base. Thoughts on adding half a sprig of rosemary for flavor to take out before serving?